Paul Myles: The Rise of Thomas Paine: and the Case of the Officers of Excise, etc, Lewes 1772. Thomas Paine Society UK, 2018. Thomas Paine is known by all Americans as one of their founding fathers: his seminal publication Common Sense kindled the War of Independence. 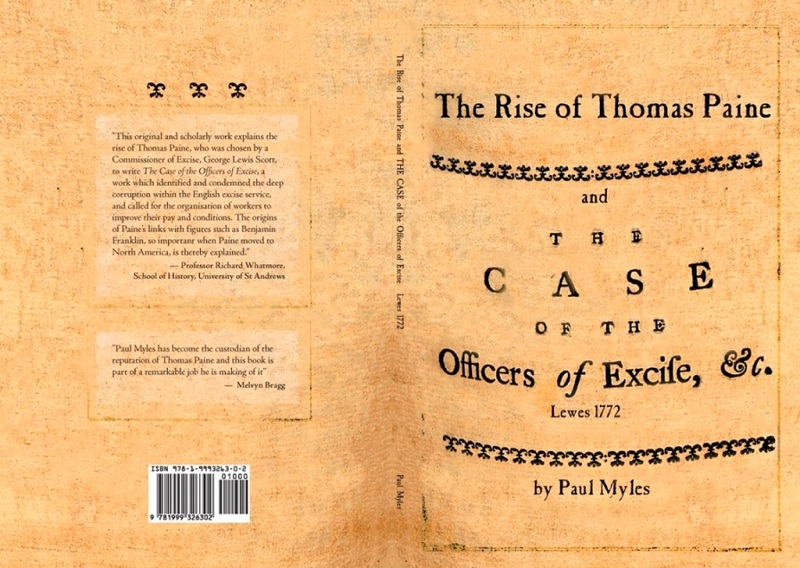 This original and scholarly work by Paul Myles explains the rise of Thomas Paine, who was chosen by a Commissioner of Excise, George Lewis Scott, to write The Case of the Officers of Excise, while Paine was in Lewes in 1772. This work identified and condemned the deep corruption within the English excise service, and called for the organization of workers to improve their pay and conditions. The origins of Paine’s links with figures such as Benjamin Franklin, so important when Paine moved to North America, is thereby explained. The Mayor of Lewes, Councillor Janet Baah, and Paul, are pleased to invite members of the Friends of Lewes to the presentation of this new book at Lewes Town Hall in the Yarrow Room at 6.00 pm on the 7th of December 2018. The event will last for one hour, and Paul will talk about the contents of the book and how missing signatures were found, leading to a new telling of this story.